As the April days passed and the deadline that my company had given me for moving to a distant city came closer, I felt I was in a quandary. Pulling me toward staying with my job on the road was the assurance of regular income to meet my financial obligations. I had no illusions about the teaching game because as much as I loved it, I knew it was terribly dependent on weather and other factors out of my control. At the same time, I could not imagine my life without flying, without my students, who had become almost like my children, and without my friends at the airport. Was there, I wondered, a way to turn my hobby into a real business and make my own employment? There had been no one in my family, except for one maverick uncle, that had ever had their own business, so I was without role models. If I accepted the dictum of my employers, I would leave this lush and comfortable valley for a home in a far away city, a life on the road, and no way to continue to run the airport. The flight school that I'd worked hard to create would cease to exist, my students would scatter to the winds and my life in the sky would be over. As the days passed and I struggled with the decision I would have to make, the rhythm of life at the little airport became even sweeter to me, and it slowly dawned on me that I was also feeling the rhythm of my own life, as it had become. What I'd experienced here had been special and more real to me than the all of the days that I'd been working at my 'real' job. I compared life on the road with that at the airport, and pondered what life would be like if the road was all there was. Without flying, I wondered, who would I be? In thinking that I might lose it, I begin to analyze my days since I came to Buckhannon, to try to understand what made them so appealing to me. I knew that the past year had been happy and fulfilling, but I'd never taken the time to stop and think about what it was that made it so. It was time to figure that out. I thought how I loved the beginning of my work days there, waking only a few yards from the airplane that will soon bear me and the day's first student aloft. These morning flights were gifts of the best the day had to offer, and they had become etched in my memory until I could play them at will, like an endless loop. I hear the click of the magneto impulse in the morning stillness as I pull the prop through to prime the engine. 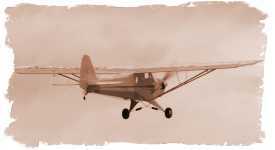 Then the student's voice replies to my shouted command of "brakes and contact", and I hear the bark and clatter of the little Continental coming to life and proclaiming that the day is good and that shortly we'll be flying through the best part of it. I smell the delightful freshness of wet grass, borne through the open window by the propeller as the engine warms, then feel the slow, rocking progress of the taxi to the end of the grass runway. The cacophony of our takeoff shocks the slumbering cattle awake in the pasture next to the runway and the airplane bounces gently on its oleos while the wheels spray halos of dew. As the wings gain purchase in the cool air we enter the element that our machine is made for and all of us, the airplane, the student and I, become content. In a climbing turn, we swing over hollows still ladled with morning fog, then turn east into a sun just cresting the western ridge of the Appalachian Mountains. The still sleeping town passes below us as we continue our way toward the practice area, through a sky so smooth that the airplane lies perfectly still in the student's hand. The ground slows and shrinks away as we climb slowly to the altitude where we'll do our maneuvers this morning. These thoughts and dozens of others run through my mind as it stages yet another match between age old enemies. Practicality and matters of the heart battle to the death in my head until finally I know what I must do. I call the company and give them my two weeks notice. I will cast my fate to the relative wind, as it were, and give up salary, bonus, expense account, company car, and benefits and become, struggling but happy, a full time, self employed aviation operator, in the mold of the hundreds before me that I had read about and admired. The days drift by as I adjust to my weekly schedule of seven day at the airport and I feel as if a weight has been removed from my shoulders. I love not having to pack a bag and leave on yet another road trip, and my instructing load increases exponentially as my availability to teach becomes known to the students. In all of this, as happens sometimes when a defining moment occurs, one particular instant stands out in my memory. It was June, some two months after my decision to leave the security of the road and I was returning from a late afternoon flight with a student. We had landed just at dusk on our 1600 foot sod strip, and were slowly taxing up the freshly mowed swath of grass that led to the hangar and office. The fireflies were popping their beacons of love and mist was beginning to settle on the valley as we approached the hangar, when it hit me. It was working. I was doing what my heart had told me to do, and it was working. I was paying the bills and feeding myself, by working at what I loved. At that moment an intensity of joy washed over me, which I have seldom felt, before or since. I was home. I was home and it was so right.